An encoder can also be described as a combinational circuit that performs the inverse operation of a decoder. An encoder has a maximum of 2^n (or less) input lines and n output lines. In an Encoder, the output lines generate the binary code corresponding to the input value. The following image shows the block diagram of a 4 * 2 encoder with four input and two output lines. The circuit diagram for a 4-to-2 line encoder can be represented by using two input OR gates. 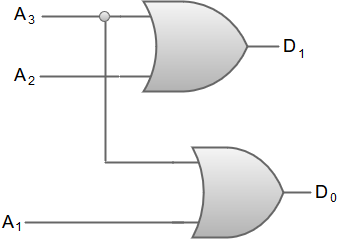 The most common application of an encoder is the Octal-to-Binary encoder. 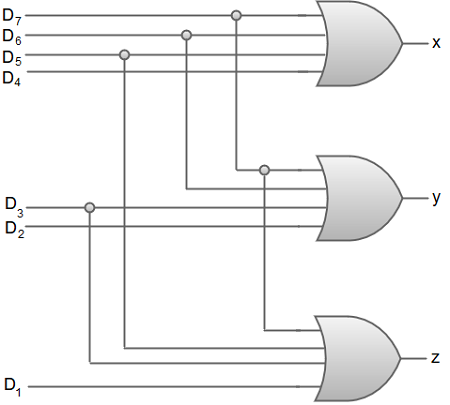 Octal to binary encoder takes eight input lines and generates three output lines. 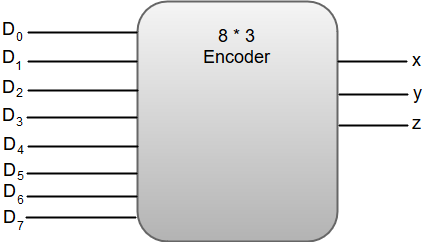 The following image shows the block diagram of an 8 * 3 line encoder. The circuit diagram for an 8 * 3 line encoder can be represented by using two input OR gates.